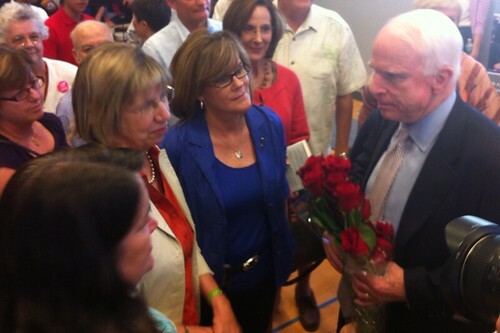 Gun bill vote: John McCain given roses by Arizona shooting survivors. ORO VALLEY, Ariz.—Democrats predicted that the senators who opposed Manchin-Toomey would suffer during the recess. To a lot of people’s surprise, this has borne out—from Arizona to New Hampshire, senators who opposed the bill have experienced poll number drops or brushback at town halls. I saw the flip side of this today at a town hall meeting in this suburb of Tucson. Sen. John McCain kicked off the event at a high school by talking about “stovepiping” in intelligence that might have allowed the Boston bombers to evade detection, talking about Syria, and talking a lot more about the “Gang of Eight” immigration bill. After two odd questions (one from a man who claimed to be Australian, talked with a strange, cotton-tongued speech impediment, and split after his questions were kind-of-answered), McCain called on a woman named Pam Simon. “I would like to thank you so much for your vote on background checks,” Simon said. There was loud, sustained applause. Simon, a former Giffords staffer, was shot through her arm by Jared Loughner; the bullet went into her chest, but she survived. “It seems like background checks are absolutely common sense,” she said. “Can you shed some light on why who voted against background checks did so? McCain wouldn’t, but he suggested that there was a “50/50” chance of a tweaked bill coming up for a vote later in this Congress. Another background checks supporter asked McCain to work on Sen. Jeff Flake and get his vote; McCain thanked him, not sarcastically, for the suggestion.